My family is in countdown mode for the big back-to-school sendoff. While my two kids are fretting over choosing their perfect school supplies and outfits, I’ve been dreading the thought of returning to the daily grind of preparing school lunches. I am not fond of what the school cafeteria serves and prefer packing the children's lunches myself. Admittedly, the seemingly simple process has caused me endless grief, what with the mishmash of lunch box materials strewn all over our kitchen. It's like a bad comedy played out every weekday morning, wherein I'm running around in my robe trying to find all the carelessly placed pieces. This year I've vowed to stop the lunch-making madness once and for all by way of a bona fide lunch management system. I've taken over a cabinet centrally located between the fridge and the fruit display. This embarrassingly simple solution took me 20 minutes to implement, and the results will save me loads of time in the months to come. Rollout trays allow me to retrieve lunch prep materials, including newly purchased lunch boxes that we've paired with old (and still working) components from last year's Bento-Ware Laptop lunch boxes. Our stainless steel Klean Kanteen collection has served us well over the past four years of school lunches, and with fresh new sport caps, they will continue to do so for years to come. The bottom drawer contains my backup supplies for when the children inevitably forget their lunch boxes at school. I'm happy to say that I've finally learned to use only items that can go in the dishwasher every night or, in the case of these lunch bags from Target made of wet-suit material, in the washing machine at the end of the week. 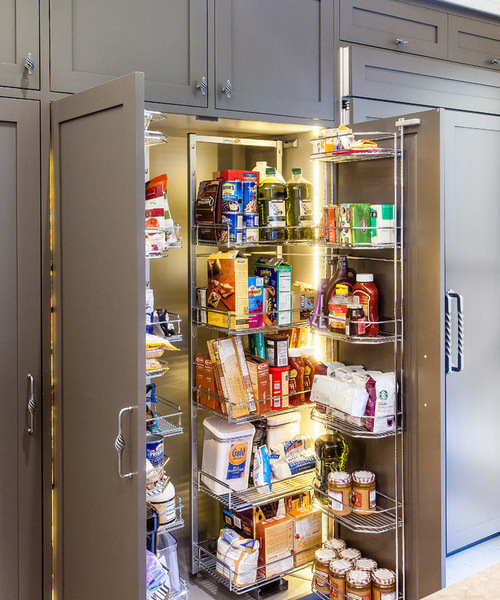 We'd all be so lucky if we had this 5-foot-wide by 2½-foot-deep pantry by Heirloom Design Build to work with every morning. Heck, each child could have a shelf dedicated to his or her own lunch box and accessories. For many of us this may not be possible, but the key ingredients here are the tall, open shelves and sliding baskets. The shelving height accommodates a variety of lunch box and water bottle heights, as well as tall cracker and cereal boxes so they can stand upright. Sliding baskets of varying sizes, like these from Sidelines, are great for wrangling water bottle caps, Tupperware tops, paper bags and plastic baggies. 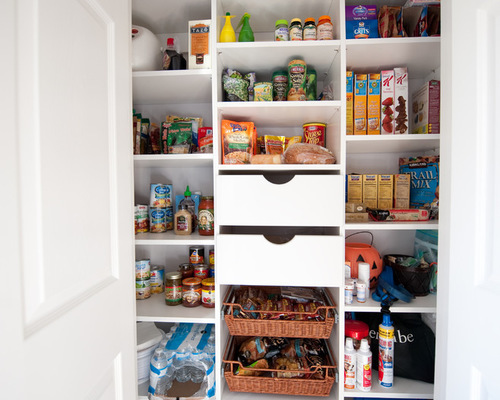 The best feature of this pantry, though, is its ability to be closed off. But let's say there isn't an abundance of space in your existing kitchen. Or the space can't be closed off. In either of these cases, baskets, such as this rattan kind, are a great remedy for keeping lunch boxes and their accoutrements in one contained place. Baskets allow clean but still damp containers to dry overnight. Even if you don't have time to wash out lunch boxes every day, mildew won't grow as quickly in open spaces. If you're working with open shelving, disguise its utilitarian purpose with a background that's calming amidst the lunch prep chaos. Designer and Houzz contributor Charmean Neithart added this soothing print from Joseph Abboud for Kravet behind floating custom shelves. Fruit stored farmer's-market-style provides pops of color against the quiet blue-gray backdrop. If you're remodeling a pantry to suit your lunch prep needs, consider adding pullout wire racks. Like baskets, they allow lunch components to dry out overnight. Unlike baskets, they let you see everything without any obstructions. There's no losing Tupperware tops in any recesses.